I'm happy to announce that FileSeek v1.3 was released this week. This new version adds sortable columns, the ability to copy selected results from the grid via the right-click menu and the number of characters displayed in the preview pane is now configurable in the options menu. Also, a number of bugs have been fixed as well, like the right-click "Open" command not working sometimes. This version of FileSeek and it's installer are also fully signed for full Vista compatibility. I urge everyone who is running an older version of FileSeek to download the new version today, and if you haven't tried FileSeek why not give it a try. You can either download an installer or an archive with only the .exe if you want to take it for a test drive before installing. Happy searching! Are you using the free version of DisplayFusion and want to try out some of the Pro features? Well, now you can! Just head over to the DisplayFusion Trial License page and fill out the unbelievably short form. My hard-working server will email you a 15 day trial license, and presto, you'll be a Pro user for 2 weeks. 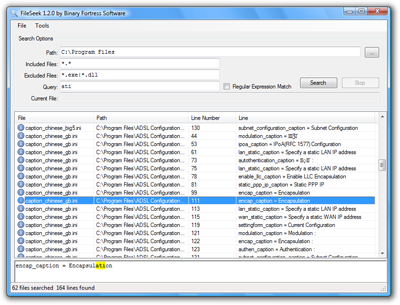 For a complete list of the features that DisplayFusion Pro has, check out the handy version comparison page. If haven't tried DisplayFusion yet and you have more than one monitor, what are you waiting for? Get in on the action today and give DisplayFusion a try right now! It has been 5 long winter months since the last FileSeek release, but v1.2 is finally here. This release brings some much needed features and has turned into the only search application that I rely on to find things on my computer. FileSeek is lightning fast and supports Regular Expression matching to perform more complex searches. With FileSeek you can specify a list of patterns to include in the search, and a list of patterns to exclude. For example, you can include "*.jpg|*.gif|*.png" and then exclude "test*.*". This will include those 3 image filetypes, but it will ignore any files that start with "test". Pretty neat, eh? Dual monitors boost your productivity by simple virtue of the fact that they offer more screen real estate to get things done, but let's get real - who doesn't want to show off their side-by-side screen setups? Grab a copy of DisplayFusion, and easily split your epic/panoramic/super-cute wallpaper across two monitors. I'm very pleased to mention that DisplayFusion has received a mention in the April 2008 issue of PC Magazine! Multiple monitors of different sizes on your computer may not always provide the best visual setup. 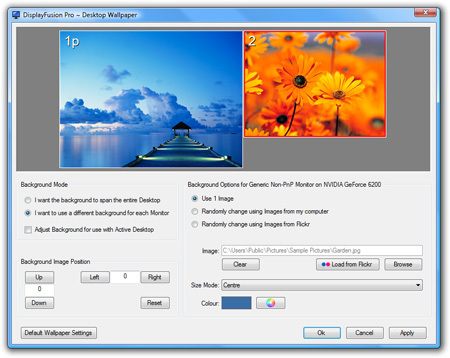 DisplayFusion assists by placing different wallpapers on each screen, even a contiguous background across displays with different resolutions. It helps controls windows, too, dragging them from screen to screen. I'd like to send a big thanks out to Gilles Reichert from Belgium for bringing this article to my attention! Having Gilles point out this article to me has led to the creation of an exciting offer for everyone. If you find any Binary Fortress Software applications (iTunes Sync, DisplayFusion... etc) mentioned in a print publication (newspaper, magazine or anything else) just let me know and you'll be the recipient of a shiny new DisplayFusion Pro license. If you're already a Pro user then I'll refund the cost of your Pro license to you. Additionally, if you can arrange to have the article shipped/mailed here I will cover the cost of shipping and send another DisplayFusion Pro license to anyone you would like. A co-worker, your spouse, a friend or just a random person. It's up to you. If you have any questions about this offer please feel free to contact me.